The buttocks have to be raised off the ground. Your bones (genetic) structure and flexibility will determine the height of your cushion. It’s usually more your genetic physical structure where the determination is made. Make sure that you sit 1/3 to 1/2 way back on the cushion to allow the pelvis to tilt forward. Then gently push your upper body backwards to have a straight but relaxed back with a slight inward curve in the lower back, if possible, without forcing — for some, this not possible without proper personal guidance. 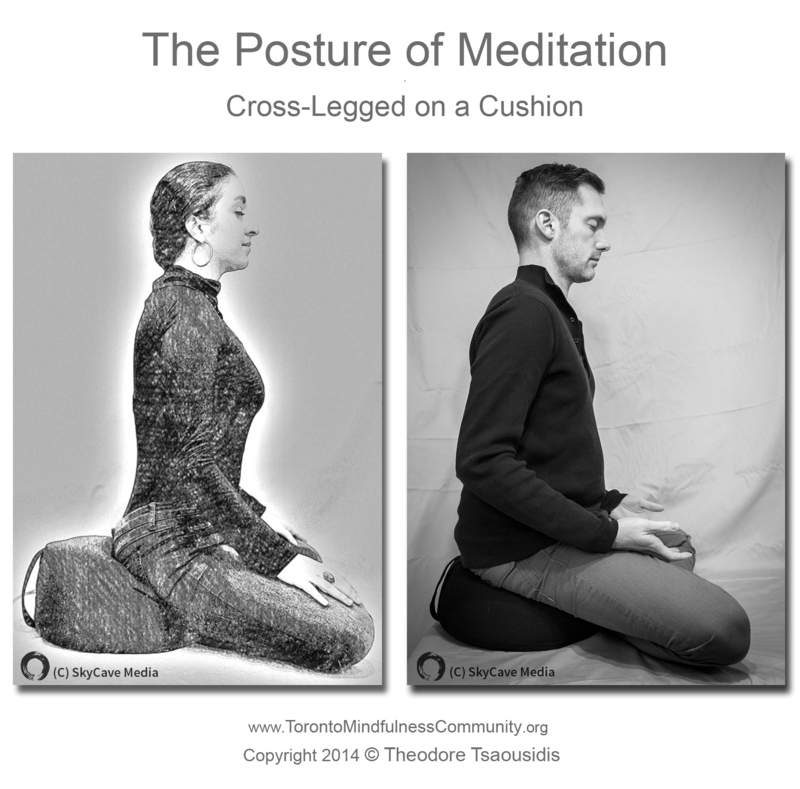 See images of sitting postures with cushion and chair. If your knees do not touch the ground, use some rolled towels or other small cushions to support them. Do not push them up, support them just enough for them to rest where they are. Your head and neck should rest gently on your shoulders. This means you do not control where you think they should be, but rather let them rest where they are, by looking straight, tucking your chin slightly in, gazing down in front of you 2 or 3 feet (without focusing anywhere or anything in particular), or keep your eyes closed. Place hands close to your body on your lap or thighs. Having them too forward on your knees may cause you to concave forward. Open your chest, by gently raising your shoulders, over backwards, and then drop them down. Do not tense. Allow the body to be at ease. Belly should be soft and relaxed. If your belly is soft and relaxed and you are off balance, you will fall forward or backwards, or sideways. The soft belly is a good way to determine if you’re physically centered and balanced. If you are finding it difficult to stay vertical and relaxed in your sitting posture you can add a little tension by putting your hands on your thighs, and pushing backwards gently. A little tension is ok, and it can keep one from falling into lethargy. The body, as much as possible, must be supported by alignment. This means to try to sense any tension you might be holding in your body before you start your meditation. To help with this, you can rock forward and sideways gently, and see if you come back to the center. If you come back to the center easily it means that your body is supported by your seat bones with the weight going straight down your spine, and gravity is supporting instead of your muscle tension. This is good. Remember however, that what is important is for you to be as comfortable as possible, rather than trying to be rigid about these instructions.